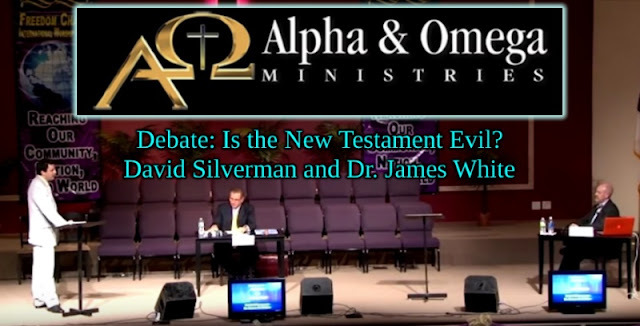 James White clearly showed that David Silverman's arguments for the nature of good and evil are irrational, standing on the biblical worldview when he calls something evil, but Silverman also relies on subjective, personal preference as a basis for morality. Some of the debate involved matters of theology. I do not get into deeper theological matters with misotheists, as they are not only opposed to such things, but cannot understand them (1 Cor. 2:14, 2 Cor. 4:4, Matt. 12:30). Dr. White discussed some theology from his Reformed perspective. Agree or disagree, Silverman was still unable to refute anything or support his own claims. However, White also managed to make the gospel message clear. Some of his detractors have said he does not do this, especially with Mohammedans, but that is easily debunked when honestly considering the source material. Here is one example (try to ignore the excessive piano music). As I understand it, closing remarks are not the place to introduce new claims in a formal debate. David Silverman did not quite follow the debate rules in his opening statements and in several places in the course of the event. He made some interesting and unsustainable assertions about Neanderthals and the origin of religion in his conclusion. Being an atheist, he used the naturalistic evolutionary scientific principle of Making Things Up™. That fits, because his naturalistic subjective morality is inconsistent and unlivable. Perhaps that would explain the desperate-sounding "Oooooh! Aaaaah!" sounds while Dr. White was talking, as if those were "Gotcha!" moments. Silverman didn't get a gotcha, except those he inflicted on himself. I recommend that Christians watch this video. There are two specific things I'd like you to notice. First, theology is vitally important when having a debate or a protracted discussion with an unbeliever. Many Christians try to refute evolution and atheism by posting a captioned picture. (We share many of those at The Question Evolution Project, but the posts contain links and other text because we're hoping to edify and equip Christians.) You do not have to be an expert in every aspect of theology, else there would be almost nobody talking about it. But you do need to have a good working knowledge of Christian essentials, whether debating or not. The second thing I'd like you to notice is the importance of presuppositional apologetics. Those of us who use it are infuriating to atheists and evolutionists, since we not only believe the Bible, but we show how their worldviews do not work. The biblical worldview, beginning in Genesis, is the only one that can consistently answer the basic questions of human experience. White made it clear that Silverman's worldview is based on his biases and preferences, not on reason or reality. I frustrate Calvinists because I refuse to identify as Calvinist or Arminian, but strongly affirm presupposition apologetics in many of my writings. I need to add that what is seen is typical among atheists. I've heard Silverman before, and much of this was very similar to other debates. Other atheist debaters (whether anonymous keyboard warriors or others) are very much like what you will hear in this debate. They equivocate on definitions, change the subject, attack the person, misrepresent people and positions, and more. Then they consider people like Silverman to be brilliant. Not hardly! Illogical thinkers applaud each other for affirming their preconceptions. Here's the hard part: the video is intimidating at first because it is three hours long all told. However, there are some links in the video itself where you can skip the introductory remarks, skip the debate rules, and so on. David Silverman begins, and his opening remarks start at the 13 mini. 50 sec. mark. Also, the audience questions begin at 2 hrs. 34 min. 39 sec., so the debate itself is just over two hours. So, get your chips and soda, get comfortable, and here is the video when you're ready.